With my free card magic tricks, you'll be able to do amazing card magic that is a useful tool in life. Anytime you need to spice up a boring party or any social occasion, being able to pull off a really cool magic trick is awesome. Magic is also a great icebreaker in sales and business. Kids are always complaining about... there is nothing to do. Well, my free kid magic tricks will give them some new skill they can learn, have fun and encourage parent/child quality time together. Most of the following free card magic tricks are easy to learn, so let's start having some fun! This free card magic trick is very easy to do, doesn't require any special magic trick card, but has a strong impact on the audience. The magician hands a spectator a deck of cards, (it can be borrowed). The cards are dealt face down into two separate piles. The cards can be dealt in any order and sequence. They can be dealt two at a time, four at a time etc. The piles do not have to be even. Whenever the spectator wishes they can stop dealing or they can deal the entire deck if they want. Now when the spectator is satisfied about the size of the piles, the remaining cards, (if any) are discarded. The spectator selects one of the piles leaving the remaining pile for the magician. The magician issues a challenge to see if the spectator can deal faster than the magician. The spectator is given a head start and both the magician and spectator deal their cards face down one at a time into two piles each as fast as they can. All the cards are dealt out. There are now four piles on the table. The magicians loses, (boo!) The spectator is the winner and is carried out on the shoulders of adoring fans. (OK, I'm exaggerating a bit… a lot) The magician makes a magical wave over the four face down piles and turns over the top card of each pile to reveal FOUR ACES! Before you start this card trick all you have to do is have the four aces secretly placed on top of the deck of cards. 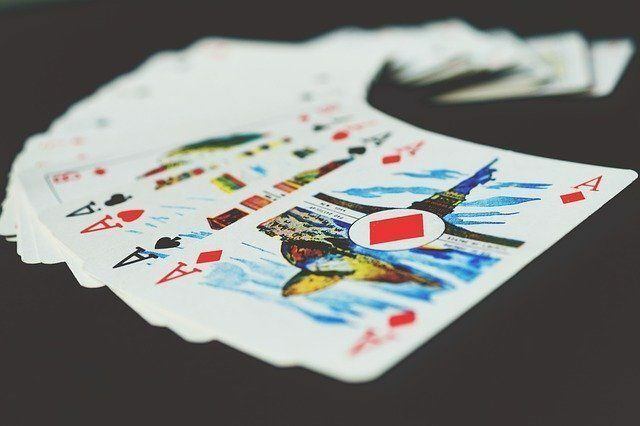 Turn the cards face up and spread them between your hands before your audience. (Make sure that you don't spread through the last four cards, the aces. Keep those hidden!) This nonchalantly shows the deck of cards to be well mixed and normal. Hand the cards to your helper and say, "I'm going to show you a crazy way to mix up cards. I'd like you to deal the cards into two face down piles." When they start dealing, the four aces (top cards) will be dealt first. After there are four cards on the table, (two ace piles of two cards each), mention that "you can deal in any order you want. Two at a time, four at a time, any direction, from any position in the deck, top middle, bottom, whatever… and stop dealing the cards whenever you'd like." What we need to happen now is to have both piles dealt out one at a time into two face down piles making four piles. This reverses the cards and brings the aces to the top. To do this effectively we need to create a reason that the cards are now dealt out in a normal fashion. We do this by making a game of it. "OK, you want to stop here." (Point at the two face down piles.) "There is no way that either one of us has any idea what any of the cards are? Isn't that right?" After they agree mention… "Let's try something a bit different. We are going to have a race to see who can deal the fastest." (Have your helper select any one of the two piles and pick up the other.) "When I say go I'd like you to deal your pile into two face down piles one at a time and I'll do the same. I'll give you a head start… ready… go!" Both of you deal out all the cards into two face down piles. Let your helper win. (Ego booster for them!) The reason for the race is to keep the helper focused on dealing the cards one at a time. They won't realize the discrepancy from the first round of dealing when they dealt the cards in any order. OK, here's the moment of truth. You have four face down piles of cards on the table with one ace on top of each pile. The trick is already done but from the audience standpoint, nothing has happened yet! All you have to do is reveal that the four aces have magically traveled to the top of each pile. There are many ways to reveal the aces. One of my favorites is to say, "If you were going to play poker and could have any four of a kind, what would they be?" 99% of the time they will respond with, "four aces." If this is the case, simply make a magical wave over the deck and announced that the four aces have now magically traveled to the top of each pile. Slowly turn over each ace and watch the stunned expression on your audience's faces. Have fun with your free magic card tricks! Make sure all the dealing is done face down. If the cards are dealt face up, the audience will see the aces together and the trick will be ruined. When the cards are first dealt into the two piles, really make an issue of the fact that your helper can deal from any position in the deck and stop whenever they want. (Just make sure that the aces are dealt out first.) This is the crucial element in this card trick. It changes from a good trick into a great free magic card trick! To learn a really cool free coin magic trick, check out The Big Coin. Looking To Learn Some More Great Magic? If your looking for some of the best magic around - stuff that the real magicians use, consider Magic Tricks Super Online Store. They've got hundred's of awesome magic tricks. Stuff that the pros use. They even have some the the cool David Blaine, David Copperfield magic! You can even check out some demo videos, so you can see exactly how amazing the magic is before you decide to buy them. Bookmark this web page because I'll be adding new free card magic tricks over time and have discount specials on select magic tricks.